Will anyone notice that I have dental implants? What about the safety of dental implants? How complicated is the surgery? What is the difference between implants and transplants? Will implants hurt after the healing is over? What is the sequence of treatment? Are CT scans used in diagnosis? Suppose I don’t have enough bone to anchor needed implants? What about my comfort and convenience? What causes dentures to gradually loosen up? What is the history of dental implants? Why do dental implants cost so much? What are the replacement options? A natural tooth consists of a crown (the part you see above the gum), and the root (the part hidden under the gum). It is the root in the jawbone that actually holds the natural tooth in place. A dental implant is a small man-made titanium fixture that serves as a replacement for the root portion of a missing natural tooth. Titanium is used because it is the most compatible with our human body. 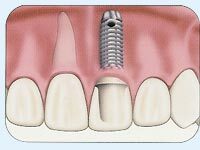 The dental implant is placed in the bone of the upper or lower jaw and functions as an anchor for the replacement tooth. After the bone has grown around the implant, implants can hold a crown, bridge or overdenture just like roots hold natural teeth in place. 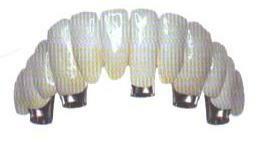 Implants provide additional support where teeth are missing without putting forces onto remaining natural teeth. They may be used to support the replacement of a single missing tooth or a complete functional set for individuals who have lost many or all of their teeth. From the Latin implantere - to implant. When teeth are lost, ongoing shrinkage of the jawbone occurs making the face look older. Dental implants can slow or stop this process. Dental implants look and feel like your own natural teeth. Dental implants eliminate the pain and discomfort of removable full or partial dentures. 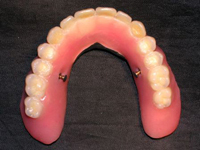 Since dentures sit on top of the jawbone and gums, continuous shrinkage of the jaw bone alters the fit of the denture resulting in slipping or rocking of the dentures. Exposed nerves and irritation of the gum tissue may add to the discomfort. Implant supported replacement teeth are like natural teeth because they are anchored securely to your jawbone. Gum irritation and the pain of exposed nerves associated with conventional full or partial dentures are eliminated. 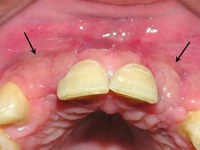 Improved Speech - With ill fitting dentures, the teeth slip and slide around the mouth. 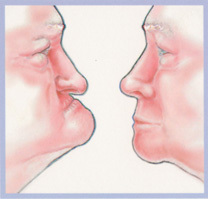 The facial muscles become tense in an attempt to hold the teeth in place. This often results in mumbling, slurred speech or clicking noises. Replacement teeth allow you to speak with confidence in a relaxed and natural tone. The average denture patient with an excellent fitting denture eats at 15-20% efficiency when compared to a person with natural teeth. As the jawbone shrinks, your chewing efficiency is reduced even more, making it difficult to eat certain foods. Dental implants can restore chewing efficiency comparable to that of natural teeth. This allows you to eat your favorite foods with confidence and without pain, enjoy what everyone is eating and not think twice about it. 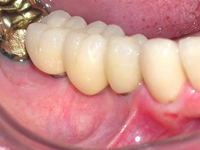 A full upper denture covers the palate of the mouth and reduces the ability to taste foods. 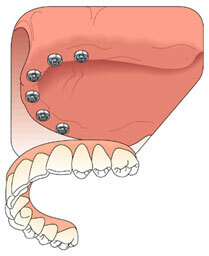 With dental implants, you can have the palate removed from your upper denture so you can taste and enjoy your food. Convenience - Dental implants can eliminate the numerous embarrassing inconveniences of removable partial and full dentures. You will eliminate the use of gooey denture adhesives that must be re-applied throughout the day. You will no longer need to cover your mouth when you laugh or smile, for fear that your teeth will pop out or fall down. 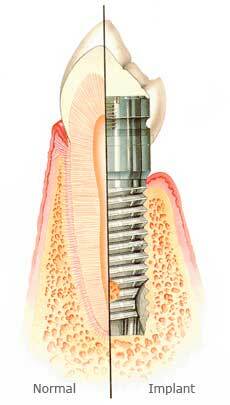 Dental implants are often more appropriate than a bridge for the replacement of one or more adjacent teeth. 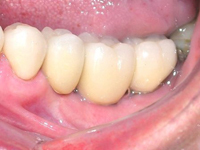 With conventional bridgework, the teeth surrounding missing teeth must be ground down. 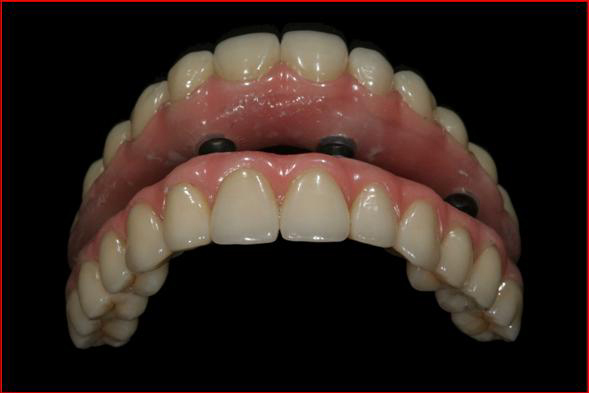 Dental implants often eliminate the need to modify these teeth, resulting in a conservative, yet esthetic restoration. Improved Self Esteem - Considering all other benefits, dental implants can improve your self-esteem. You may feel better about yourself. You can regain nearly all the capabilities that most people have with natural teeth, giving you renewed confidence, and allowing you to enjoy life, do what everyone else is doing and not think twice about it. The implants will be covered by the gum, and the dental replacement will cover the implant connectors, so no one will know unless you tell them. After completing the treatment you will probably gladly inform anyone of the benefits you have received from the treatment! Dental implants represent the state of the art in current dental treatment regimens. 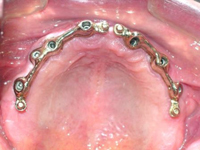 As stated above, they are essentially cylinders of titanium, or titanium alloy that are placed under local anesthesia. Dental implants, and other medical applications (hip, knee) of titanium metal have been used for replacement of failed body parts since the 1950’s, when the metal’s ability to “osseointegrate” was first discovered. Repeated research has shown the unwavering biocompatibility of titanium and the body’s miraculous acceptance of it to the extent that it is unquestioned as one of the safest materials to be used in regenerative procedures. Anyone who is missing one or more of their teeth due to injury, disease, or decay may be a candidate for dental implants. If one or a few teeth are missing, dental implants in conjunction with a crown or bridge can replace those teeth without losing more bone. If all or most of your teeth are missing, the dental implants may be placed to replace a loose fitting full or partial denture. Adequate bone in your jaw is needed to support the implant(s) along with healthy gum tissues that are free of periodontal disease. Occasionally, older patients express concern that their age may prevent them from enjoying the benefits that dental implants offer. However, health is more of a determining factor than age. If you're healthy enough to have a tooth extracted, you're probably healthy enough to receive dental implants. (Dr. Pollard’s oldest patient to date is his 91 year old mother!) Certain chronic diseases may contraindicate implant treatment. Dr. Pollard will determine if you are a candidate for dental implants after a careful evaluation of your dental and medical health history. 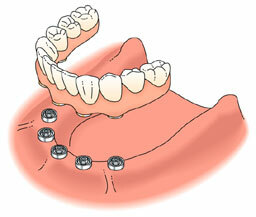 The answer to this question depends upon the type of dental implant treatment provided. The complete implant reconstruction process may take from 4 to 9 months and in some cases longer. 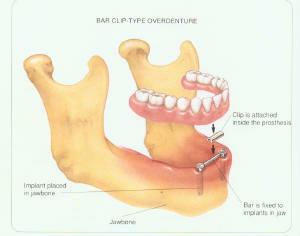 Time is needed for your jawbone to grow around the implant and for your replacement teeth to be made. Procedures vary, but it usually includes two surgical steps and then the restoration is fabricated. First, Dr. Pollard places the dental implants into your jawbone. Bone cells grow around the implants that may take up to six months to occur. Dr. Pollard then makes a small incision in the gum tissue and connects a healing post to your implant(s). The gum tissue heals around the post for a period of 3-6 weeks or longer. Dr. Pollard then attaches another type of post and makes the replacement teeth. It may take several visits and several months to complete the restoration process. As stated above, implant surgery is done in two steps. The first step, placement into the jaw bone, is most commonly done with just local anesthesia. It is generally not a complicated procedure but the surgery requires great precision. Dr. Pollard’s staff is trained in aseptic surgical technique, and the room is set up similar to an operating room. Every attempt is made to insure success, including complete sterilization of equipment, whilst utilizing the most modern techniques. Step two, which involves the uncovering of the implants after they have osseointegrated (fused), is a relatively minor gum surgery procedure, requiring only local anesthesia also. Both steps entail minor postoperative discomfort, and you will be given the indicated antibiotics and pain medications. Dr. Pollard’s staff will give you written instructions to follow after the appointments, and if followed will result in very few complications. Just as with any surgery, there can be some discomfort. Anesthesia is used to eliminate any discomfort at the time of the procedure. Most patients report that there is very little discomfort and that they were much more comfortable following the procedure then they anticipated. Dr. Pollard will prescribe medications to ease any discomfort that may occur. No! Since they consist of an inert metal they are not rejected by the body. The “rejection phenomenon” comes into play when living tissues such as heart or kidneys are involved. If implants fail, the nature of the failure is mechanical, with no rejection cells in play. And, by the way, the success rate of implants on average is around 95%, modified by location, bone health and quantity, number of implants, etc. Transplants are organic in composition, and are taken from another body and placed in a recipient’s body. The body’s immune system recognizes them as foreign, and will try to reject them, unless prevented by anti-rejection drugs. Implants are inorganic in composition, and the body’s cells do not recognize them as foreign, with no immune system reaction to them. Patients are totally unaware of the presence of implants and they are entirely comfortable. Step 1: Examination and Diagnosis consists of a comprehensive oral examination, complete x-rays, diagnostic casts, and sometimes panorex x-rays, a CT scan, and photographs. Step 2: Stage 1 Surgery- Implants are placed. Osseointegration takes 3 to 6 months. Step 3: Stage 2 Surgery -- Implants are uncovered and are checked for complete healing. 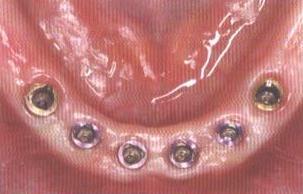 Healing cuffs or abutments are placed. Impressions are taken. Temporary is made. Step 4: Final restoration is placed. Fine tuning of the bite is done. Recare: Follow up, recare visits are performed at regular intervals (3, 4, or 6 months). Regular return visits for cleaning and oral hygiene checks are critical to the long-term success of dental implant treatment. Dr. Pollard uses state of the art CT (cone beam) along with diagnostic software (Simplant) in order to achieve accurate and reliable diagnosis. Although it is not used in every case, certain situations require the ultimate amount of information that can be obtained in order to render treatment in a well planned and well designed fashion. Dr. Pollard will evaluate this situation using CT radiography and the accompanying Simplant software. If you indeed are determined to be deficient in bone, Dr. Pollard can usually recommend and deliver the needed procedures (bone augmentation) to restore the missing bone. The following graphics and photos show several of the standard, everyday procedures performed by Dr. Pollard to restore insufficient bone. This graphic demonstrates areas from which donor bone may be removed for augmentation procedures. This graphic demonstrates the placement of donor bone into an area of deficient bone. This photo demonstrates a patient who has had a bone augmentation procedure performed, and is now healed and ready to receive implants. This graphic demonstrates the anatomy of the maxillary sinus in a normal state, with teeth present in the posterior part of the mouth. This graphic demonstrates the shrinkage of the bone that occurs after the posterior teeth are removed. 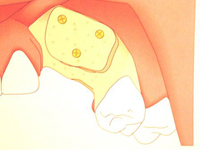 This graphic demonstrates the placement of implants into the augmented bone. 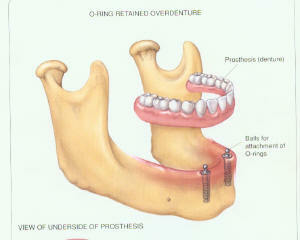 This graphic demonstrates the placement of teeth onto the healed (osseointegrated) implants to restore function. Dr. Pollard and his highly trained staff will take you through the implant course from start to finish and make it as easy as possible. Keep in mind that we provide both the surgical and restorative (tooth) phases and are able to avoid the usual treatment coordination problems that exist when two or more doctors are involved. In order to make the procedures as comfortable and painless as possible, sedation dentistry is offered. 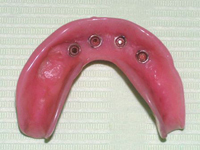 Many times patients notice that initially snug-fitting dentures loosen over time. 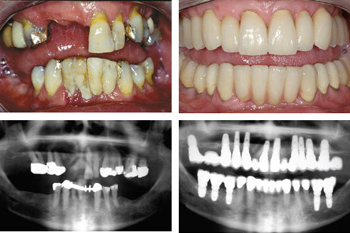 This is caused by a gradual bone loss resulting from the lack of bone-preserving stimulus that natural teeth provide. Pressure from a denture actually speeds up the process, resulting in a denture that simply won’t stay in place, especially in the lower jaw. Implants have the benefit of acting like tooth roots, and prevent bone from melting away. In 1952, in a modestly appointed laboratory in the university town of Lund, Sweden, Professor Per-Ingvar Brånemark had a lucky accident -- what most scientists call serendipity. Much to his irritation, Dr. Brånemark discovered that it was impossible to recover any of the bone-anchored titanium microscopes he was using in his research. The titanium had apparently bonded irreversibly to living bone tissue, an observation which contradicted contemporary scientific theory. His curiosity aroused, Dr. Brånemark subsequently demonstrated that -- under carefully controlled conditions -- titanium could be structurally integrated into living bone with a very high degree of predictability and, without long-term soft tissue inflammation or ultimate fixture rejection. Brånemark named the phenomenon osseointegration. The first practical application of osseointegration was the implantation of new titanium roots in an edentulous patient in 1965. More than forty years later, the non-removable teeth attached to these roots are still functioning perfectly. The fee for tooth replacement with dental implants will depend on several factors, including the number of teeth being replaced and the number of implants required to support your replacement teeth. Some additional procedures may be required prior to the placement of your dental implants to ensure their long-term health. Typically, there is a fee for the surgical procedure and a separate fee to attach the posts and construct your replacement teeth. 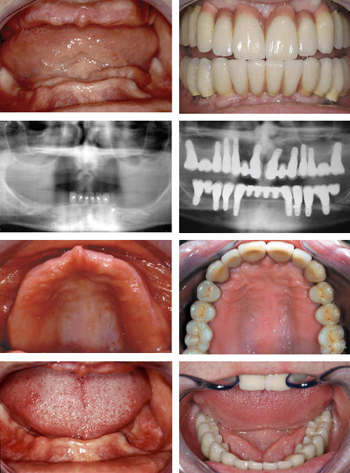 To obtain a specific fee estimate, it is necessary for us to examine your mouth. After a thorough diagnostic examination, we will recommend the treatment that is best for you and what your investment would be for the procedure. The time spent by Dr. Pollard and his staff in providing implant treatment greatly exceeds the time spent in the chair by the patient. Treatment planning, which includes going over a patient’s health and dental history, reviewing x-rays, constructing a 3-dimensional model of the planned treatment on the computer, and examining diagnostic models and perhaps photographs is done on every case without the knowledge of the patient of the amount of time spent. A huge number of steps are performed by support staff and laboratory technicians in bringing the demanding treatment to fruition, all by exceptional people who are much more qualified than the ordinary staff who deliver normal, every day dentistry. Successful implant dentistry requires the amalgamation of the skills of many higher level professionals than what is encountered in the normal dental office. Also, the materials used in implant dentistry are more costly. The titanium implants themselves, along with the exotic metals used to create the restorative result are very expensive. More expensive and highly refined equipment is used in implant dentistry, as well as the training behind its use. Research and documentation studies have proven the effectiveness and long lasting results of dental implants, with a long term success rate of 95% in documented studies. Good oral hygiene is one of the most critical factors to insure the health of your dental implants. Dr. Pollard’s staff will instruct you on the proper home hygiene procedures to keep your dental implants and remaining teeth clean and healthy. Regular visits to Dr. Pollard are important so he can assess the health of your replacement teeth and gum tissue. You can rely on your replacement teeth to look, feel and function like natural teeth for years to come. 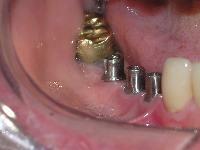 Long-term success of implants depends on how well they are maintained. Regular dental visits are essential. Dr. Pollard will develop a dental visit program to ensure the health of your implants and remaining natural teeth. Periodontal disease can strike when teeth and gums are not properly cleaned. If left untreated bone loss, which weakens supporting structures, can lead to loss of dental implants as well as tooth loss. Home Care: Daily brushing and flossing are absolutely necessary for long-term success. There are also many supplemental products that allow you to clean the implants properly. Dr. Pollard will design a home care regime that will suit your individual needs. Brushing: Dr. Pollard may recommend a cordless electric toothbrush. Whether you use a standard brush or electric toothbrush, Dr. Pollard and his hygienist will review your brushing techniques to ensure that you are cleaning the area properly. Oral Irrigation Systems: Research has shown that oral irrigation is effective in reducing plaque accumulation around dental implants and natural teeth. Dr. Pollard may also suggest that you use a special mouth rinse. Flossing: Good home care includes daily flossing. Floss threaders are very helpful in allowing you to reach around implants, under bridges and bars so these areas can be easily cleaned. Dr. Pollard may also recommend special types of floss. Interproximal Brushes: These small dental brushes, also called "Proxabrushes", are specifically designed to clean between the teeth and implants. While not a replacement for dental floss they are helpful in cleaning hard to reach areas. Dental Visits: It is typically recommended that patients visit Dr. Pollard for professional cleanings every 3-6 months. However, he will design a dental visit program specifically for you. Tooth Pastes: Most toothpastes contain fluoride, since they are designed for natural teeth. Fluoride does not hurt dental implant restorations. Avoid toothpastes that contain excessively abrasive ingredients (stain removers, smoker's toothpastes, etc). 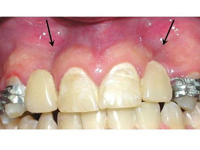 Abrasive toothpastes can create wear on acrylic and can remove the glaze on porcelain. Mouth Washes: Most commercial mouth rinses are designed to give a "fresh breath feeling." Alcohol is used in most mouth rinses and could cause dryness of the mouth. Patients who have dry mouth should avoid mouth rinses that contain alcohol. There are plenty of alcohol-free mouth rinses available today. Regular sized dental implants vary from 3.0mm up to about 6.0mm in diameter, and are placed in a prepared site in the jawbone. These are the implants that have had all the research done on them, and that are the mainstay of dental implantology. They have been around since the discovery of osseointegration in the 1950’s, and are the ones that are referred to in success studies. They require a surgical preparation for their placement, as opposed to a self tapping regime with the smaller (about 2.0mm) mini implants. Mini implants were originally designed as temporary implants to help support temporary teeth while the permanent, full sized implants healed to the bone. They have been abused by a few doctors who are touting them as being permanent solutions to situations that they simply were not designed for. These doctors claim equal success using the mini implants as compared to full sized implants, but this is simply not the case. No research has been conducted on the long term success rate of mini implants, whereas volumes of research has been conducted on their full sized counterparts. Breakage, since they are very thin, and lack of osseointegration with the jawbone are two of the main problems with their use. The Food and Drug Administration considers any implant less than 3.0mm. 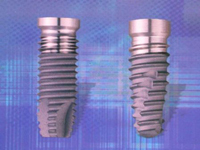 as a mini implant, and does not recognize them or approve their use as equal to the full sized “real” implants. Mini implants are used in certain situations in the lower jaw with patients who have been missing teeth for a long time, who have well healed bone, usually long after their teeth have been extracted. Patients who are elderly, and who have medical problems that preclude the placement of full sized implants are usually the only ones for whom this type of treatment is recommended, and that is with a great deal of concern for ultimate failure. Dentists who tout mini implants as being an economical alternative are not telling the truth about the dangers of actually misusing and incorrectly treatment planning a device for which it simply was not designed. Stick with the real thing and don’t chance your health and ultimate waste of money with something that has been abused by a few unethical doctors.